If you're getting an impulsive blood clot to the head, perhaps, Zen Zest’s new line of massage oils can help you. Labeled Uplifting, Stimulating and Calming, these massage oils promises to remove tension, work on sore muscles, improve your immune system, and even give us emotional comfort. Add to that their long-lasting signature fragrance so pleasant that even the most macho of them all would go soft and say “oh yeah,” but in an appropriate manner. All variants are made with imported, high quality essential oils and contain Jojoba Oil and Green Tea Extract that smoothens and moisturizes the skin. Talk about soft and supple; this is the smoothest way to go. The Uplifting Massage Oil doesn’t get its name for being promising alone. It actually contains known anti-depressants Bergamot and Neroli essential oils, ensuring a brighter and lighter feeling right after a fruitful massage with one. The Stimulating Massage Oil on the other hand has Tangerine and Peppermint oils that "energize the spirit" and "invigorate the mind." It has a citrus and minty scent that are said to be familiar with regular spa visitors. Now we know they’re doing that on purpose! This one is perfect for prepping you up for a long day ahead. Among the three, however, the Calming Massage Oil continues to be the runaway success among the selection. It has a mild floral scent courtesy of the Lavender and Rosemary essential oils it contains. The fragrance also has the power to lull you to sleep, which is phenomenal for stressed out insomniacs and the like. It works best before nap time or bedtime. Anti-depressants aside, the Zen Zest massage oils are just three amazing things you can give your woman that are guaranteed to make her happy. 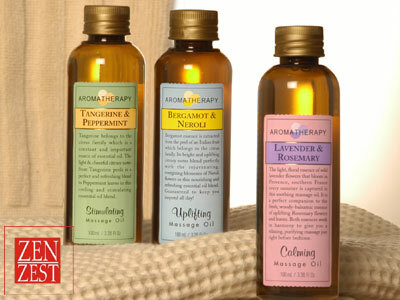 The Uplifting, Stimulating, and Calming massage oils are available in all Zen Zest outlets nationwide.